The City of Lowell is trying to bring a new renaissance to the park named after a Lowell-born founder of the San Francisco Renaissance. 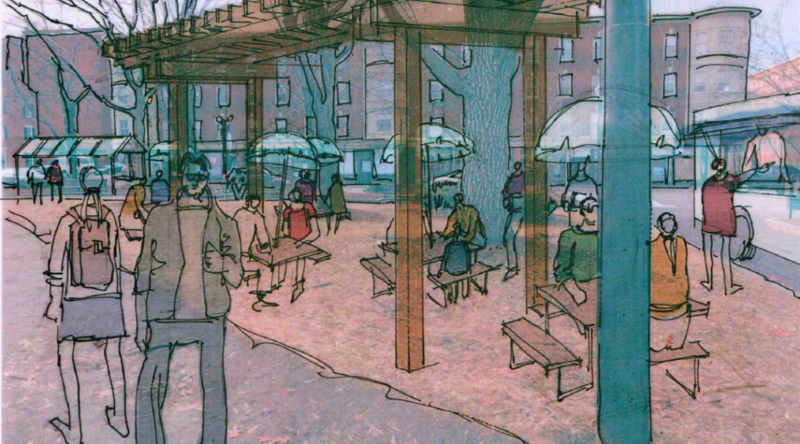 And if the city can raise $25,000, it will get a matching $25,000 from MassDevelopment, marking a $50,000 upgrade for an important but overlooked space. The fundraising page is now open and accepting donations. Without a home, we found ourselves on the hunt for a permanent space for the Mill Yard equipment—the shipping container, furniture, lighting, barrels, and generator. We selected Kerouac Park. At Kerouac, we have a chance to do something permanent, something MUCH BIGGER. We want to apply what we’ve learned from the pop-up Mill Yard, by transforming an underused and little loved slice of the park into a permanent place for people to congregate and enjoy Downtown. The renovation and vision for this space is as public park, event venue, business incubator and place to enjoy downtown. I recommend reading through the page, it’s an impressive and ambitious plan. I actually have some insider knowledge about some events planned for this space (more on that some other time), but suffice to say there are already great things lining up to use a renovated Kerouac Park. All it needs is some good old fashioned Lowell support! If you have a few dollars to spare, please donate! Plastic Bag Ban Ordinance Tonight! Fellow White People…Can We Talk? Go Solar If You Can, Before 2020! Recycling in Lowell: Clean Up Your Act! Kim Curtis on Recycling in Lowell: Clean Up Your Act!